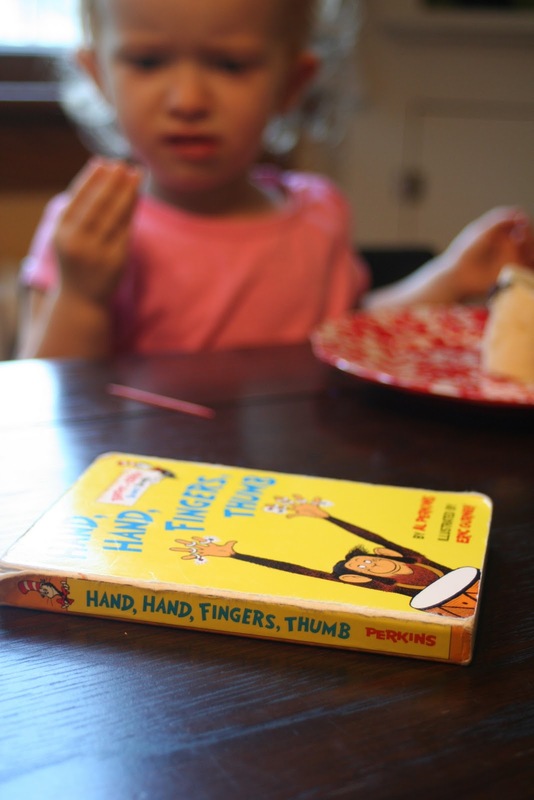 Little Page Turners: Pirate Food! What do you do with sick, grumpy pirates? 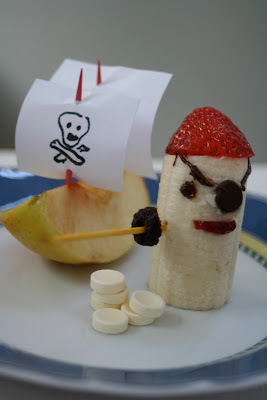 You try to cheer them up with pirate-themed food! Fill a ziplock bag with a portion of your pancake batter, snipping off a bit of the corner. Pour your batter into the pan to make traditional pancakes. 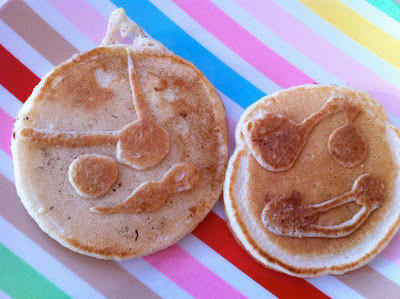 Flip over and using the bag, add a pirate face to the cooked side of the pancake. Flip again to finish. If you're really brave, try drawing a pirate ship using the plastic bag to drizzle your batter into the pan. This was my best attempt. For a much more impressive ship, check out Filth Wizardry. Cut a portion of banana for the pirate body. Add a strawberry bandanna by slicing the strawberry at an angle. Add a chocolate chip for the eye patch, a raisin for the good eye, and a craisin for the mouth. Use a toothpick to draw the eye patch strap with melted chocolate. Another toothpick and raisin form the sword. Piles of yellow smarties become the pirate's booty. For once the girls happily obeyed me when I called them to the table. What really cracked me up, however, was that they both came carrying books! While a little long for young children, this fun tale of pirate adventure is just right for older preschoolers and young school-aged children. When Pirate Pete steals the Queen's treasure map, he makes haste for Mermaid Island to find the buried treasure. On the way his path crosses several islands, all of which hold promise of pirate booty... and where there's gold, he's a'going! But will he find gold or will the Queen catch up to him? The story follows a familiar rhythm, repeating at each island but with enough surprises to make the story exciting. Your kids will love the brilliantly colored and clever illustrations of the different islands: a candy island, a sleeping island (full of beds and with palm tree night lights), a leprechaun island, and a dragon island! It's a fun little story full of pirate speak and just enough danger to satisfy the most demanding little pirate. I'm pretty impressed by your pirate ship. 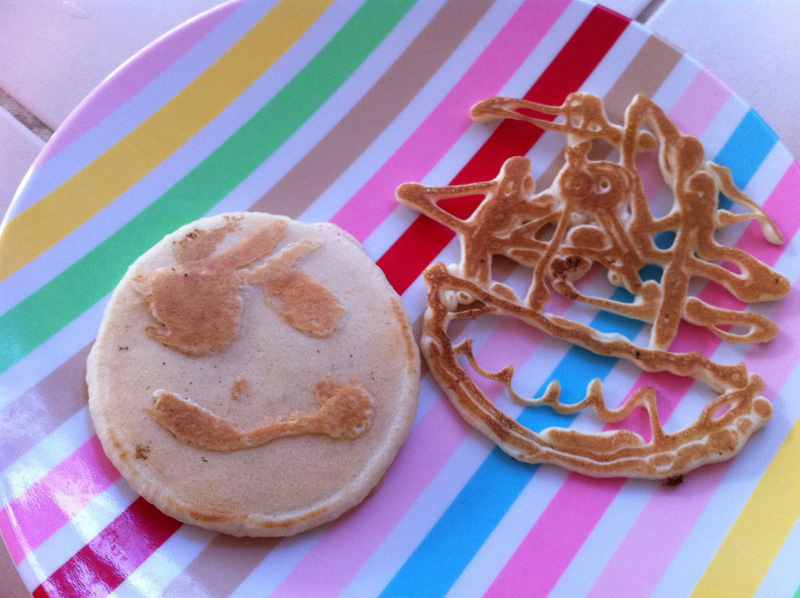 I am impressed with the ship - no way I would be able to do anything like this - I cannot even do a decent pancake. But the banana pirate is more within my range and looks delicious! SO cute! That ship is very cool. Awesome! I recognized the pirate ship pancake right away. It must be so much fun to live at your house! You do an amazing job creating memories for your girls! 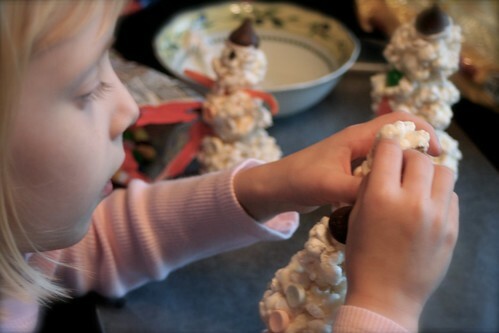 I'm so happy you blog about these ideas so that I can steal them and give my kids similar memories! That ship is awesome! How many did you kill, before you got that one? I love the pirate food, and I'm going to have to check out that book. Super fun ideas! Great job with the drizzled pancake. It really does look like a pirate ship!